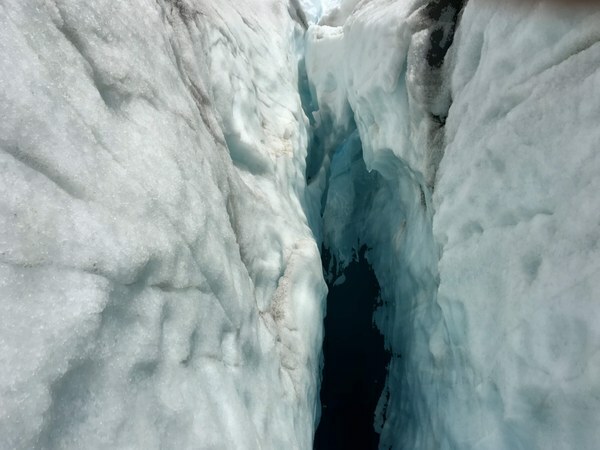 You are here: Home / Blog / What it feels like to be lowered into a crevasse...voluntarily! 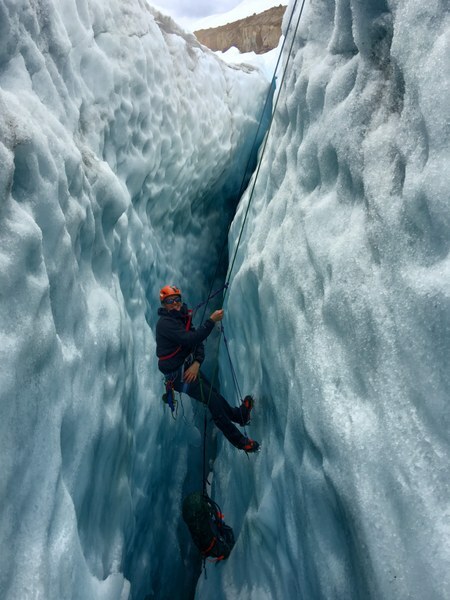 What it feels like to be lowered into a crevasse...voluntarily! 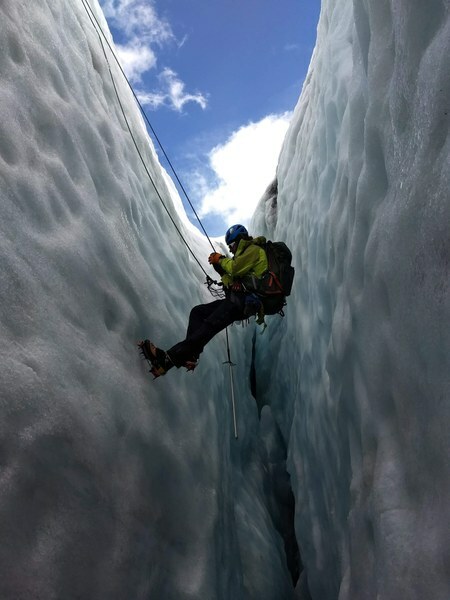 This spring, Everett Mountaineers member Hadley "KanHike" Krenkel was lowered into a crevasse as part of his Basic Climbing Course. Get an insiders view deep into the void! I joined The Everett Mountaineers in November 2015, and shortly thereafter completed a PCT thru-hike in the summer of 2016. 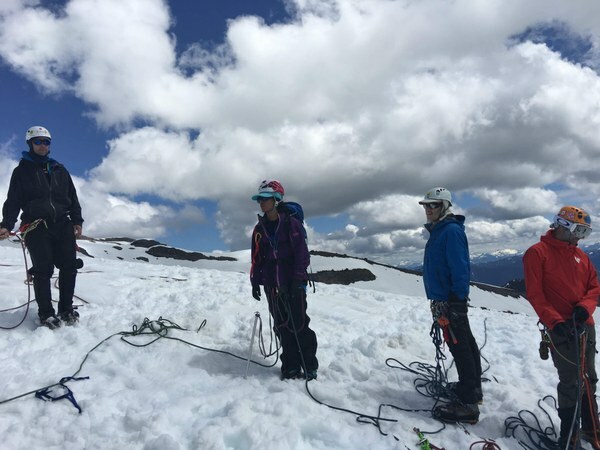 I’ve always been interested in alpine climbing, especially anything over 8,500’, and so in 2018 I enrolled in Everett’s Basic Climbing Course. 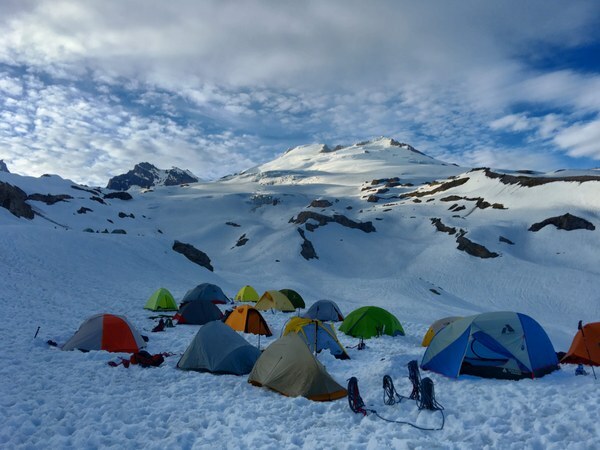 Basic is a 6-month course to teach you what you need to know for Mountaineering expeditions in the Pacific Northwest, and I was eager to learn. After months of lectures, conditioning hikes, and field trips, the course students and instructors met as a group for what would be the last, but most memorable trip, for the 2018 Everett Basic Class. We met on a beautiful Saturday morning. This meeting felt different – we were all were becoming close after nearly 6 months of class together, forming great friendships forged over memorable experiences in the mountains. 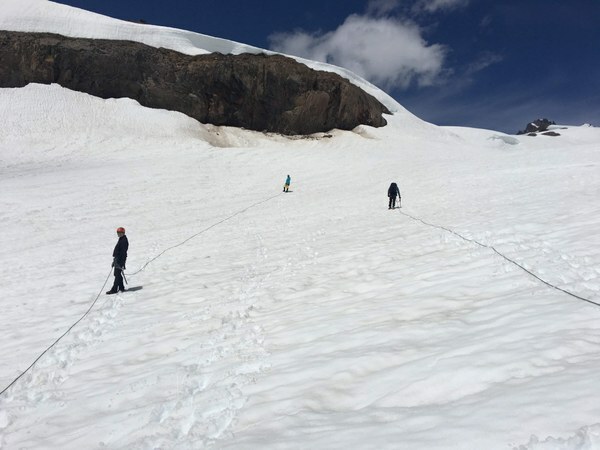 On tap for this weekend’s lesson: getting lowered into a crevasse, then using our prusik to get out while the rest of the team rigged a z-pully for rescue. But first we had to make our way to the glacier. The trip upward turned into a fun filled adventure, complete with an unanticipated stream crossing. We came to find out later that we probably didn’t need to cross the stream, the instructors just wanted to know how we would handle what came our way. We reached the area where everyone camps and left our overnight gear, then headed up to the actual glacier. Always looking for an opportunity to learn, as a group we practiced self-arrest, sliding down the hill on our butts then rolling over so the sharp tip of our ice axes dug into the snow until we stopped moving. Now it was time for some real fun! We all hesitated, until finally I volunteered! “Well why not?” I thought. We went two at a time. My partner “Mike P” and I were lowered first. As we were tying in, a rush came over me, followed by a sense of pure calm. I could definitely feel my ‘stoke’ level begin to rise. Mike and I had no idea what to expect. It was scary going into the unknown…into the black abyss. We were lowered a good distance – far enough that we could barely make out the voices of our instructors saying, “Okay, prusik out!”. At first, I was frustrated trying to mind a stubborn prusik, but then the same sense of still calmness overcame me. I realized where I was. I remembered that I should enjoy this moment. I mean, how many people get the opportunity to safely be in a crevasse? Surrounded by the clearest blue ice, if I looked closely I could see a river of water flowing under the frozen walls. Inside, it was absolutely quiet of all outside noise, near silence, other than the slight sound of the trickling water. I felt an unexplainable peacefulness. As much as I wanted to stay in the crevasse, our exercise was about getting out, so I started the process of prusiking my way out. I had a great team. They got me out pretty quick and even gave me a hand over the lip! The rest of the day was almost a blur after that incredible experience. The next day, weather was supposed to move in so we stayed closer to camp and practiced setting anchors and clipping thru, until the weather finally chased us out. We all got back to the cars quickly, still riding the adrenaline rush of the day before… or maybe it was the promise of pizza. All photos courtesy of Hadley Krenkel.